These are the newest, latest version of Protege touch screen organiser, the Protege II, designed to sell at $46.50 but the market is swamped with the older less good proteges! If you have bought a Protege touch screen organiser you may now be noticing limitations and want to upgrade. 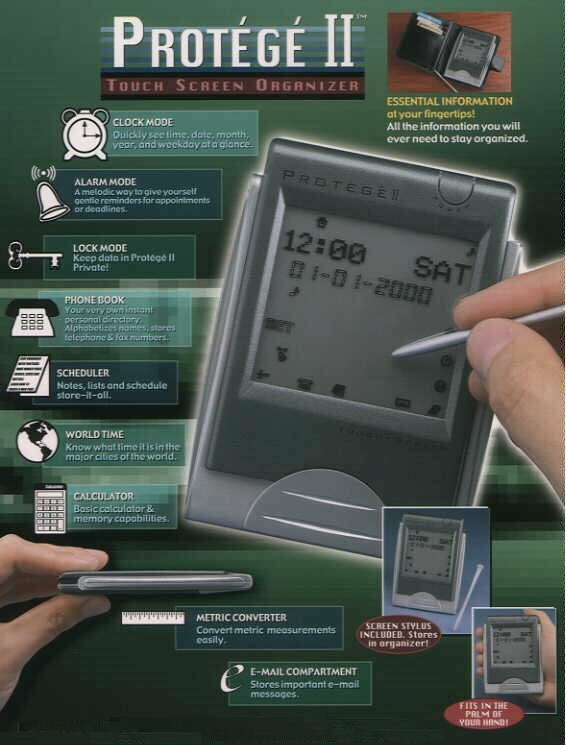 If you have not bought a Protege Touch screen organiser treat yourself to the latest greatest Protege II. That's just $0.00 more than what is now a heavily dated model and an amazing $18.51 savings off recommended price. Read about the advanced features of these cool devices and grab yourself one at a $18.51 discount. Those Palm type PDAs are really cool, but will you actually use it? If you have a palm, do you take it out, what if it were stolen? Protege II touch screen protege organiser has a lot of the cool functions of a Palm, lets you test out whether you would really use one and is cheap enough for a theft not to be a tragedy. Quickly see time, date, month, year and weekday at a glance. A melodic way to give yourself gentle reminders for appointments or deadlines. Keep data in protege II Private! Your very own instant personal directory. Know what time it is in the major cities of the world. protege touch screen organiser fits in palm of your hand. Touch Screen Protege Organiser text, images and video are copyright.